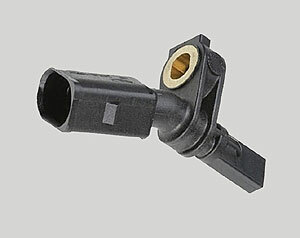 The wheel speed sensor measures the wheels’ revolution speed respectively the covered distance or angle per time unit. Various systems work with the signals of the wheel speed sensor. The mode of operation of ABS and ASR as well as ESP is depending on the information about the wheel speed. Navigation systems are benefitting from signals of these sensors as well. They calculate the covered distance from that information. By means of the versatile usage, the wheel speed sensors contribute directly to driving dynamics, safety and comfort, less fuel consumption and lower emission values. Wheel speed sensors are distinguished in active and passive sensors due to their mode of action. Active = the sensor is only “activated” by applying the supply voltage, and then creates an output signal.